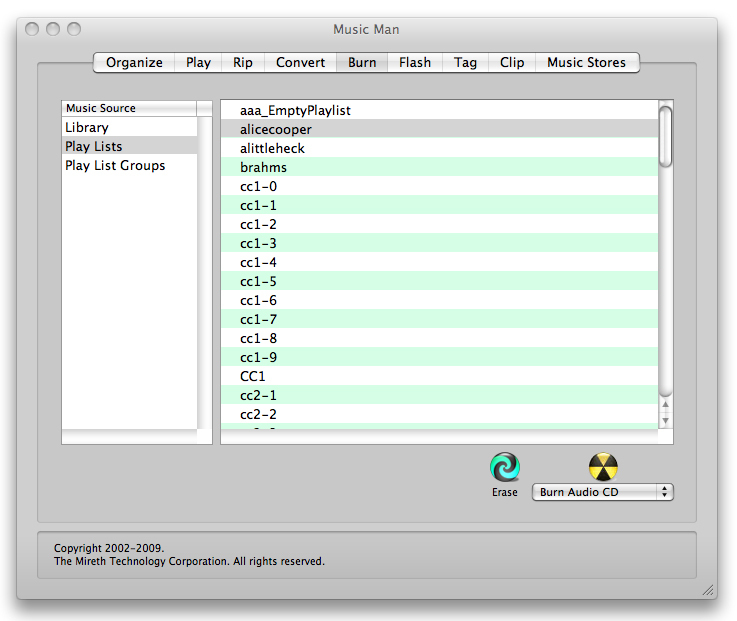 [prMac.com] FOR IMMEDIATE RELEASE -- Mireth Technology Corp. has released a new version of Music Man, its Mac OS X ripper, converter, burner, player digital music software. Version 2.0 of Music Man uses a new, easier to use, tabbed interface with quick drag and drop zones for playback, conversion, burning and writing to flash. It also provides direct links to DRM free music stores as well as adding support for conversion to bookmarkable AAC and conversion from MIDI music formats. "We agree with Steve Jobs’ thoughts on music," said Donna Johnson, President. "Music Man respects iTunes DRM protected music and will play it, but will not convert it to an unprotected format. Music Man also supports music in open formats such as Audio CD and Ogg. Not only can it play, convert and burn music in open formats, Music Man also links to Music Stores offering music sold in open formats, typically from independent music companies." Music Man is an easy to use, full featured digital music software for Mac that can rip, convert, burn and play MP3, WMA, WAV, AAC, AIF, Audio CD, MIDI and Ogg Vorbis on Mac OS X. Music Man was designed specifically to be both full featured and easy to use, so that users can enjoy a full range of digital music features. Originally designed to burn and play MP3 CDs, Music Man has evolved to include ripping, converting and burning of other formats as they have developed, including WMA, WAV, ACC(M4A,M4B), MIDI (MID, KAR), Ogg Vorbis and Audio CD. Music Man provides burning capability to Audio CD, MP3 CD, DVD and USB Flash drives. Music Man also offers many unique burning features, such as variable burn quality that allows for burning up to four times as much music on a USB Flash Drive as when using standard burn technology. Another unique feature is the mono mixdown feature. There are many situations in which using ear phones in both ears is inconvenient or unsafe, such as when grocery shopping, when walking at night, or when minding children. In these situations, listening with only one earphone in and one ear free would be preferable, but can hinder the listening experience because stereo sound depends on both the right and left track being heard together. Unlike stereo, Mono mixdown burns all the music to both the right and left track, so one ear listening still hears both tracks.